Wrap It Up! Wrap, Scarf and Sarong Workshop with Rhonda Fazio from Dyer Maker Studio at the Bridgewater Public Library on Tuesday, August 8 th @ 6:30 pm. Join artist Rhonda Fazio from Dyer Maker Studio (www.dyermakerstudio.com) as she demonstrates the art of wrapping a scarf to suit your personal style. You'll learn many different ways to wear wraps and scarves you already own. It's as fun as playing “dress up” as a kid. 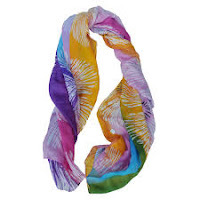 Bring a scarf, wrap, or sarong you want more ideas for, and Rhonda will help you brainstorm how best to wear it! Ms. Fazio just completed the Entrepreneurship for All South Coast Business Accelerator program and is now marketing her "Dyeing to Wear It: Creating Community through Color" workshops. She has received a number of grants from the Massachusetts Cultural Council and works with secondary school aged children in the classroom and in her studio located at the Narrows Center for the Arts.